only one in the world who has been able to recreate the original Gershwin sound. 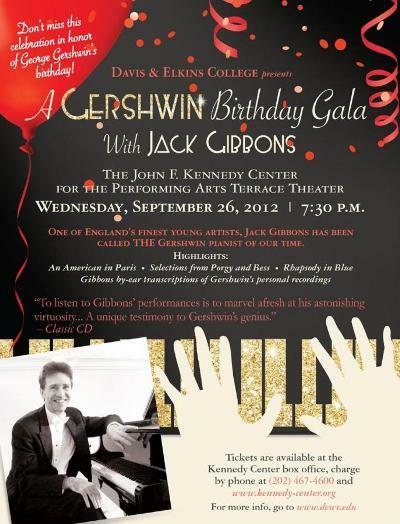 �Among the most exhilarating feats of pianism I�ve heard"
"Jack Gibbons is THE Gershwin pianist of our time"
tickets, visit the Kennedy Center's website. Jack Gibbons returned to Carnegie Hall on Monday November 15th 2010. "Jack Gibbons is utterly unique in the music world." The Times describing his performance as "monumentally mournful"). 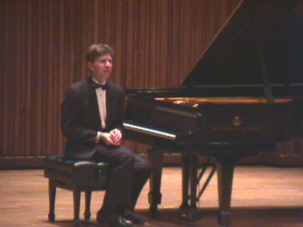 Hailed by the Sunday Times as "a remarkable talent", JACK GIBBONS is widely recognized on both sides of the Atlantic as one of the finest pianists of his generation, his concerts being regularly received with standing ovations at New York's Carnegie Hall and Lincoln Center, and at London's Queen Elizabeth Hall, where he has appeared annually for over 16 years. Described as "an awe-inspiring and prodigiously gifted classical pianist" by the London Times, Jack Gibbons was hailed by the BBC as "THE Gershwin pianist of our time" following his triumphant debut at the famous BBC Promenade concerts in the Royal Albert Hall in 1995. In 2002 he won special praise for having fought his way back from a near-fatal car accident to perform once again to capacity crowds at London's Queen Elizabeth Hall and New York's Carnegie Hall. The British press described his achievement as "miraculous" and "gutsy". New York's Time Out wrote of his Carnegie Hall come-back concert: "The vivacious British Gershwin specialist made a triumphant return to the New York stage after spending most of the year convalescing from a terrible automobile accident. Welcome back, Jack!" In June 2010 Jack Gibbons was appointed artist-in-residence at Davis & Elkins College, in the beautiful Appalachian mountain town of Elkins, West Virginia. Jack Gibbons began performing in public at the age of 10 and gave his London debut at 17 with an all-Alkan program that included the legendary Concerto for Solo Piano (recordings of the concert were subsequently requested by the BBC and the Juilliard School of Music in New York). At the age of 20 Gibbons won First Prize in the Newport International Pianoforte Competition with a performance of Beethovens Fourth Concerto which was described by the jury as "masterly". In 1994 he gave his New York and Washington DC debuts to tremendous acclaim, and the following year made his debut at the BBC Proms at the Royal Albert Hall. His highly popular recitals at Londons Queen Elizabeth Hall were an annual feature at the South Bank for over sixteen years. Jack Gibbons also performs frequently with major orchestras from the UK and US, including the City of Birmingham Symphony Orchestra, Royal Philharmonic, Hall�, etc.. In 1998, for the centenary of Gershwins birth, Gibbons performed his unique Gershwin transcriptions throughout the world, giving concerts in the UK, Holland, France, Italy, Czech Republic, Australia, Africa, USA, etc.. Jack Gibbons' performances have been described by the press as "compulsively communicative"; in addition to his playing Gibbons regularly intersperses his programs with brief anecdotes and musical illustrations, revealing secrets of the music he plays in a way that is both educational and highly entertaining. 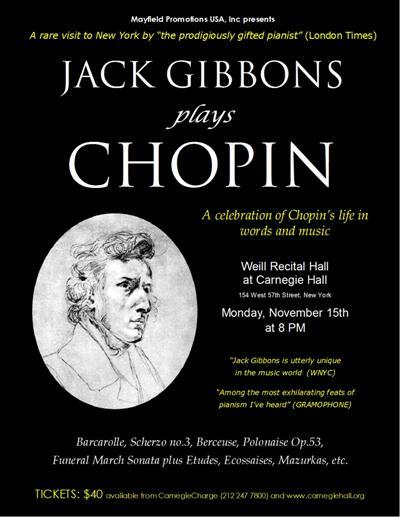 Jack Gibbons is well known for his performances of Chopin, of whom he has made a special study, and of Chopins less well known contemporary, virtuoso pianist/composer Charles-Valentin Alkan. In January 1995 Jack Gibbons gave the first performance in history of the complete Opus 39 Studies of Alkan in a single 3-hour-long concert in the university city of Oxford, England. He repeated the event a year later before a sell-out audience at the Queen Elizabeth Hall, London, the Times described the event as "awe-inspiring". Amongst Jack Gibbons' other achievements can be listed his concept for the promotion of young artists in the music profession. Gibbons' ideas became reality thanks to the generosity of multi-national company W. H. Smith who backed the project and formed what is now known as the Young Concert Artists Trust (or YCAT), a lasting legacy for young professional musicians, providing help and guidance at the beginning of their careers. Gibbons has been described by the press as �a composer of distinction�, his music �deeply moving�. His Lullaby, honoring the memory of Gershwin�s biographer Edward Jablonski and performed at Carnegie Hall in 2005, was described as �capturing a unique American wistfulness and vastness of loneliness that also marks the Andante of Dvorak's 9th Symphony and the 2nd movement of Barber's violin concerto�. Jack Gibbons began writing music at the age of 9, his first work being a two movement Sonata in C major. By the age of 13 he had written and fully orchestrated a three movement piano concerto as well as a large collection of virtuoso piano pieces and songs. At 14 the distinguished British composer Sir Lennox Berkeley awarded him a special composition prize for his Piano Rhapsody. Since then his performing career prevented him from pursuing his own writing. With time on his hands during his recovery from a life threatening car accident in 2001 Gibbons began writing again for the first time in 25 years. He has since had his music performed with great success at Carnegie Hall in New York, the Queen Elizabeth Hall in London, and elsewhere, and recorded by the BBC. Jack was invited to be a composer in residence at the Italian home of Lady Walton (wife of composer William Walton). Gibbons� music to date includes over 50 songs (mostly for soprano voice), 20 piano works, and two works for string orchestra. As both performer and speaker Jack Gibbons has broadcast extensively both in the UK and in the USA, Europe, Australia and the Middle East. In celebration of the Gershwin Centenary he wrote and presented a feature program for the BBC entitled "Gershwin in Focus" with Oscar-winning actor Ben Kingsley as the voice of George Gershwin. Gibbons' relaxed and communicative performing style translates well into the broadcasting medium and his informative and entertaining descriptions of the music he plays have been singled out for particular praise in the press.